I'd just like to offer a big thanks to Brunonia Barry! She did a reading at Nicola's Books last night to a large crowd (even on such a rainy night!) and I'm sure everyone had a fantastic time. She read the first chapter of The Lace Reader (which I can't recommend enough) and then gave us some history about herself and the evolution of the story and the book. She talked a little about Salem (where she lives) and gave us a little insight into her next book (it will be taking place on the same street as the House of the Seven Gables, and while the main characters from The Lace Reader won't be directly involved in the story, we will be seeing them as denizens of Salem). 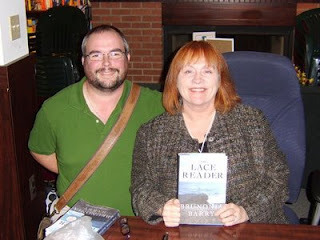 She signed our books and took time to talk to each and every one of us there, and then took a little bit more time afterwards to talk with me and another reader to discuss the ending of the book and the possibilities that are raised in the end. Thanks again, Brunonia, for such a great evening!